Michelle and Barack Obama's love affair is being brought to life on the big screen, but during an appearance on The Real, the first lady spoke about her husband's early years as a student. The president has always been candid about how he wasn't always the greatest student and even got into a little bit of trouble, but FLOTUS hilariously gave her own insights into the young Barack. 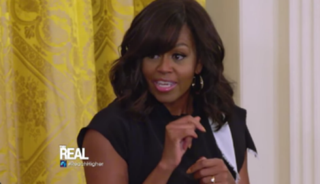 "Barack fooled around in high school," the first lady said during the episode, which aired Tuesday. "He didn't take school seriously in high school. He barely got his work done. He was a bum! And it took him a second. He had to grow up a little bit." During the segment about higher education, Michelle stated that the president didn't become serious about his education until transferring to Columbia University. The first lady also dished on how she dealt with her first night at college. "The first night of college was a mess. It was a one-room triple. I got sheets that were too short for the bed. I didn't have the money to get the right sheets. For the entire first year, I was sleeping half on the sheets and half on plastic," she recalled. When parents asked for advice on how to deal with their high school seniors leaving for college, Michelle laughed. "When they get to be 17, you'll be like, 'Bye, Felicia!' " she said.